A while ago I created a post by selecting some of the paragraphs written by Peter Hitchens over the years. How easy it is for bad things to go on under our noses. How many people in Cleveland, Ohio, must have wondered if something odd was happening in the house of Ariel Castro, but did nothing about it because, well, everyone else seemed to think it was OK? 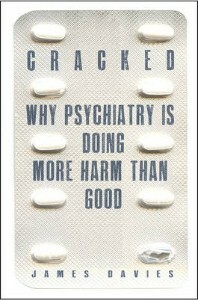 The book, Cracked – Why Psychiatry Is Doing More Harm Than Good, by James Davies, published by Icon, is calmly and clearly written in straightforward layman’s English. The author has serious academic qualifications which entitle him to take a view on the subject. He has spoken to a wide selection of experts. In most cases, there is no significant difference in effect on depression between antidepressant pills and dummy sugar tablets. But the pills do have potent side effects (often these are most radical when people stop taking them, which is why they should only be given up under medical supervision). Many of the medical experts who recommend these pills, in the media and to other doctors, receive large fees from the drug companies, without disclosing this. Many medical journals gain substantial income from large orders for reprints, which come from the drug companies. The profits from this industry are colossal. There it is, going on near you, a grave disgrace that you can help to end. Will you? will you walk on by? I, too, would be grateful for your comments. If a doctor tells you that he knows what is wrong with you, and that a certain pill or procedure will put it right, you will generally believe him. If that pill (for instance) has severe and unpleasant side-effects, you will endure them for the sake of the cure. But what if the side-effects are the only real, that is to say objective, effects? This may well be the case with ‘Antidepressants’. In The book I am here discussing (Cracked – Why Psychiatry is doing more harm than good’, Icon Books, ) the author, James Davies, says (on page 98) : ‘…we do know that anti-depressants have effects. Mostly they have placebo effects and side-effects. We also know that for many people they can have sedating or numbing effects’. There are several implications of this important statement. Some of the responses to my first article on this have maintained (apparently from the point of view of patients taking these pills) that the drugs have done them good. 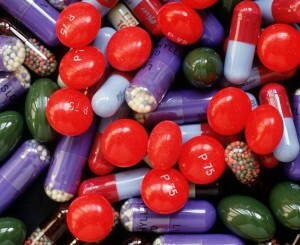 Well, the research certainly shows that patients who take pills often feel better. It’s very difficult to argue about this. Measuring subjective mood and mood changes is virtually impossible, in any way that could be called ‘proof’. But it *also* shows that patients in blind trials who take dummy sugar pills get pretty much the same benefits as those who take the real thing (which, as we have already pointed out, is based on a wholly unproven theory about chemical imbalance in the brain, and has no proper scientific basis at all). This suggests that the curative effect is largely a matter of concern and trust, as described above. This raises an interesting ethical puzzle. Would doctors be justified in knowingly prescribing dummy pills to such patients, if everyone in the industry would keep quiet about the truth? If the patients were cheered up by the pills, and no harm was done, then what would the objection be? You’ll have to answer that one for yourself. But outside the tests, it doesn’t arise. Because the real pills are the ones that are prescribed, and they are far from being inert. They contain potent chemicals that have known physical effects, including – in some cases – a tendency to make the patient think seriously of taking his or her own life. Mr Davies’s book does not address this side of the question, which is probably a good thing – because hardly anyone in the public, the media or politics is prepared to believe that anything so horrible could be happening, We will probably have to get a good deal further down the road of exposing the uselessness of ‘antidepressants’ before anyone will begin to consider the possibility that they may be harmful. Like a number of relatives, doctors, psychiatrists, coroners and pathologists, I have looked into the worrying correlation between antidepressant use and suicide. I study inquest reports in search of it ( and found another instance this morning – usually I come across three or four a month in local and national outlets, and would no doubt see many more if I had a means of scanning every local newspaper or every inquest transcript. I often see several more in which the Coroner simply has not bothered to inquire but where the circumstances are highly suggestive). I also know that the standard pro-drug riposte ‘Of course they would be suicidal. They’re depressed, for goodness’ sake!’ is invalid for several reasons, not least the known and undisputed evidence of what is called ‘suicidal ideation’ among people who have taken some antidepressant drugs. But he does say (after, rather bizarrely, claiming that caffeine alters our state of mind – where does he get his coffee? )(P.98-99) ‘These pills , in other words, don’t cure us – they simply change us. They can throw us temporarily into a foreign state of mind, into an altered version of who we are. ‘From this standpoint, antidepressant medications do not return us to health as medical pills aim to do- they rather manufacture a new state of mind, an often unnatural state’. These thoughts, by the way, form part of a highly disturbing discussion of the case of a bereaved man who ceases to be able to weep after taking medication. Here we touch on the wider issue of the whole DSM (Diagnostic and Statistical Manual) which, as edition follows edition, has classified more and more normal human states of mind and being as ‘illnesses’, just at the time that the drug industry has begun to produce pills which claim to control or counter these complaints. Thanks to my own interest in this subject, I was not shocked by Mr Davies’s revelations about how this book comes to be compiled. It is the shame of my trade of journalism that his detailed exposure of this process will come as a surprise to most readers. I could easily reproduce most of the book here. But I will just mention a couple of other features which seemed to me to be especially interesting. You really, really should read it. I won’t return here to the vast scandal of ‘ADHD’, a scandalous ‘diagnosis’ of a subjective complaint, followed by objective drugging, which still, amazingly, has its defenders. But I will mention a Canadian study into that supposed ‘disorder’ (p.41) which showed the following: Instances of ‘ADHD’ among school-age children rose, in a steady diagonal on the graph, the younger the children were. Let me put that another way: ‘the younger you are in the class, the more likely you’ll get the diagnosis’ .This truth was replicated in studies of the USA and Sweden (I know of none here). It is hard to see how, if this were a genuinely individual ‘diagnosis’ or a genuine ailment, that this could be so. But it is. As Mr Davies says ‘The relative immaturity of the younger children was. In effect, being wrongly recast as psychiatric pathology’. I’ll say no more about ‘ADHD’ at this stage. I usually need to spend a week or two in the gym before taking on the ‘ADHD’ lobby, not because their case is any good, but because there are a lot of them and it is exhausting countering the same bad argument over and over again. Those who wish to have a go at me in defence of this appalling fantasy are directed here http://hitchensblog.mailonsunday.co.uk/2010/05/the-adhd-fantasy-posted-once-more.html . I shall be surprised if I have not anticipated any point they choose to make, and answered it fully. The ‘ADHD’ problem is, however, a good example of the pact between lazy doctors, guilty people and greedy businessmen which has created the scandal of modern psychopharmacology. I do not (as some claim) reject the concept of mental illness. Nor do I argue that nothing can be done about it. Nor do I dispute that in a few small areas, neurology has managed to penetrate some of the secrets of the brain. Modern brain surgery is responsible, highly-skilled and curative, and we owe a great debt to those with the skill and courage to undertake it. I just think that the current dissemination of poorly-understood pills, backed by dubious research and cynical promotion, is wrong and needs to be exposed as such. The difficulties of doing so are summarised above. Most people feel a natural suspicion of large companies whose gigantic profits depend on the continued sale of these pills. Many have learned to be a bit suspicious of doctors who need some way of sending unhappy patients home happier than they were when they came in, and who can receive cornucopias of goodies , free trips and the rest if they play along with those large companies. But the greatest obstacle to a serious debate is the complicity with the doctors and the drug companies of many of the patients themselves. They have been persuaded to believe that they have been helped by medications which have certainly had an effect on them. But what is that effect? Let me here stress, once again, that patients worried about such medication should under no circumstances simply cease taking the pills they have been prescribed. Sudden withdrawal can produce severe effects. Cessation should only take place under qualified medical supervision. It is virtually impossible for someone in my position to counter the claim that ‘It made me better’ or ‘You don’t understand that depression is a real illness’ or ‘I rely on these pills for my happiness’. Statements of this kind cannot be tested, and so cannot be disputed. These statements tend to be unconscious regurgitations of drug company advertisements (legal in the USA) or indirect publicity spread through compliant medics (the usual method in the United Kingdom), material, current now for many years. I can only refer these patients to the objective information we do know – the studies done on the reported effect of these pills, on the suppression by the drug companies of research showing that they have no greater effect than sugar pills, on the significance of that suppression itself ; and on the emptiness of the endlessly repeated claim that depression’s cause is known, and that it is a ‘chemical imbalance’ in the brain. And I can urge them to read this book. It is the gateway to wisdom and understanding on a major topic of our time. And, in a debate where billions of pounds are at stake, I can readily declare that I have no interest in this subject, apart from a desire to speak the truth. Hi Brian, I think you’re doing a great job raising awareness. I commented on Mr Hitchens’ blog this morning so I’m copying it here for you. I gave you an unashamed and blatant plug; hope you don’t mind. I saw this article on ‘AntiDepAware’ this morning. I agree with you; the over-medicating of society is a huge problem, particularly as the medicines can then cause other problems. Antidepressants alone can cause suicide, homicide, mania, worsening depression, birth defects, et cetera. Statins, the drug of the moment and heavily promoted even in healthy people, are linked to muscle damage, memory loss, energy loss, diabetes, and depression. Then when you present to the doctor with memory loss, caused by the very statin that your GP prescribed, you will be put on another drug for early signs of dementia. The only winners are the pharmaceutical industry who have done a fantastic job making people believe that we were all born with inherent defects that only pharma can fix. They’re doing it for your own good, don’t you know? As for corrupt doctors and psychiatrists; It seems to be a global problem. I live in Ireland where the pharmaceutical industry’s involvement is palpable everywhere, from suicide awareness groups, sporting events to education. People get a bit miffed sometimes when I point this out; they really believe that the pharmaceutical industry want to help people. I too would have walked on by and thought little about this before 2009 when my lovely son died as a result of an antidepressant-induced death. My son was taking Citalopram for 17 days when he killed himself and another young man. He did not have a violent bone in his body. Irish psychiatry came out in their droves in the media, basically to call me a liar and protect their drugs. They never once asked me a question relating to my son! Most, as you say, walked on by but a couple didn’t. I had the help of 2 lovely doctors, Dr Michael Corry, and Professor David Healy who is based in Cardiff; although, they both had to face the wrath of the psychiatric profession for not ‘walking on by’. It seems that the only people speaking out are the ones who have been directly affected by the dark side of medicine. The good doctors who try to speak out are ridiculed and bullied by the pharma defenders who are making a fortune in speakers’ fees and ‘unconditional’ education grants. If selling their souls for ‘pharma money’ equates to ‘unconditional’, well then maybe they’re right and I’m wrong. Leonie, thank you for this, it is much appreciated. I’m only too willing to accept any sort of plug, unashamed or otherwise. A forthright message from you, as ever. You are the eloquent spokesperson for so many who have been bereaved or harmed; and feisty with it!